The Provincial competition was much stiffer, but our athletes performed excellently. Unfortunately for David McCurdy, he wrestled at his peak the day before, but he still represented our team and School like a gentleman. Callum Lovelace earned a second place finish. His toughest opponent in the round robin, who eventually went on to win gold, defeated Callum. Bella Turner-Galaise put on another technical clinic to win GOLD. Just as impressive is her ability to wrestle an entire match without changing her facial expression one iota. We should note that Raya Rhein was wrestling in a weight class above that which she wrestled all season. 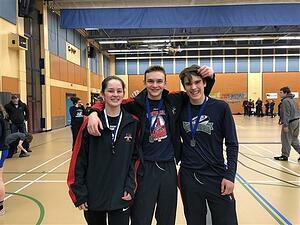 Despite that, or maybe because of it, she had the best day of her short wrestling career and won GOLD against competitors from two of our biggest rivals, Sackville High and Parkview. Gut Gemacht, Raya! Quinn Emery was lucky to have a very competitive, large bracket in the 65 kilogram class. He dominated his opponents until his last match, which he lost against possibly the best wrestler in the tournament to win SILVER. Greg Otto represented the Otto wrestling dynasty with class when he won SILVER against an opponent with more experience. Anna Emery and Aimee Cooper both had particularly difficult weight classes against very tough opposition. Anna had some of the top wrestlers in the province, and Aimee was wrestling up a weight class. Nonetheless, both of these young women put on heroic efforts in order to contribute to our final result. Téa Racozzi, for the final time in her high school wrestling career, won GOLD. She captained our team in a dignified and respectful manner all year – on the mat and off. Our wrestlers were better because of her, and this is the most important criterion for captaincy. Our team will miss her next year, but she helped set the stage (mat) for more success. Of the four categories we brought to provincials (junior boys, senior boys, junior girls and senior girls), we were most hopeful for our senior girls to bring home another provincial banner. They came up short by only one point. If Camryn Kleynhans had not been diagnosed with a concussion on Thursday, she would have competed and our girls would have won handily. Finally, a special thanks goes to Olivia Drava, who volunteered so much of her time as an official, and to Jennie Weisner, who helped keep our wrestlers intact all season long. We want every child to find an activity they can pursue with passion. With three seasons of sports and over 20 different sports to choose from, we're pretty sure your child will find a few to love. Download our Athletics Photojournal.